Summary: A 71-year-old female patient presented with a wide-necked carotid cavernous aneurysm for which stent and coil placement was planned. Arterial tortuosity required direct puncture of the common carotid artery for access. The procedure was performed while the patient was receiving antiplatelet and anticoagulative therapy. To avoid potentially hazardous and prolonged carotid compression, a closure device (Angio-Seal) was used at the end of the procedure. The postoperative period was clinically uneventful. Sonographic and angiographic follow-up of the carotid artery were performed. Some endovascular treatments in the field of interventional neuroradiology are more likely to require heparinization and antiplatelet therapy during and after the procedure, putting the patients at risk of bleeding from the puncture site after sheath removal. With the advent of intracranial stent placement requiring strong anticoagulation and antiplatelet regimen during and after angioplasty, the potential for significant morbidity is increasing. Consequently, it is important to favor the conditions of rapid local hemostasis for prompt sheath removal after intervention. In recent years, percutaneous devices have been developed to reduce time to hemostasis. The devices have provided the ability to safely remove femoral sheaths from patients receiving anticoagulative medication immediately after the procedure, without having to reverse anticoagulation. For endovascular treatment of cerebrovascular diseases, vessel tortuosity may prevent successful access via the femoral route and, in some circumstances, direct puncture of the supra-aortic vessels is advocated to access the targeted lesion. We report the case of a 71-year-old patient who presented with a wide necked carotid-cavernous aneurysm for which a closure device was used immediately after stent and coil placement in the aneurysm via transcarotid and transfemoral approaches. A 71-year-old woman was referred to our department for endovascular treatment of a symptomatic (diplopia) right-sided carotid cavernous aneurysm. The results of a neurologic examination were consistent with a right third nerve palsy. Because of the wide neck of the aneurysm, primary stent placement in the carotid artery at the level of the aneurysm neck was planned. The stent placement would have allowed further safe coil deposition into the sac, avoiding coil protrusion into the carotid lumen. With the patient under general anesthesia, a 6-French guiding catheter (Envoy; Cordis, Miami Lakes, FL) was positioned into the right common carotid artery via a right femoral approach. Because of the supra-aortic vessel tortuosity, difficulty of stent tracking and delivery was anticipated, and a direct puncture of the right common carotid artery was performed to allow the placement of a 6-French sheath. Once the right common carotid artery was punctured, a .035 hydrophilic angulated guidewire (Radiofocus/Terumo Corporation, Tokyo, Japan) was navigated into the distal cervical carotid artery under road mapping control. Next, a 6-French sheath (Radiofocus/Terumo Corporation) was carefully advanced over the wire so that its distal tip was positioned into the origin of the right internal carotid artery. Once the carotid sheath was in position, IV anticoagulative treatment was initiated (a bolus of 5000 IU of heparin and then an immediate infusion of 3000 IU/hr, a bolus of 250 mg of aspirin). This sheath allowed the advancement of a second 6-French Envoy guiding catheter into the petrous segment of the right internal carotid artery. Under road mapping control, a balloon-expandable 18-mm-long coronary stent with a 4-mm diameter (S670; Medtronic/AVE, Santa Rosa, CA) was navigated into the cavernous portion of the right internal carotid artery over a .014-inch guidewire (Transend, Boston/Target, Fremont, CA). Once in position, the stent was delivered by balloon inflation so that it fully covered the neck of the aneurysm. A 20-mm Equinox balloon microcatheter (Micro Therapeutics Inc., Irvine, CA) was then navigated inside the deployed stent. Via the right femoral route, an Excelsior microcatheter (Boston/Target) was navigated into the aneurysm sac through the stent mesh. The aneurysm was subsequently packed with mechanically detachable coils (DCS-18; William COOK Europe A/S, Bjaeverskov, Denmark) and Guglielmi detachable coil (Boston/Target) by using the remodeling technique so that it avoided inadvertent coil protrusion through the stent strut into the carotid lumen (Fig 1). When the control angiogram attested to the circulatory exclusion of the aneurysm, the procedure was discontinued. To allow rapid and safe hemostasis, an Angio-Seal (Daig/St. Jude Medical, St. Paul, MN) closure device was placed at the site of the carotid puncture (Fig 2). The femoral puncture site was also closed with the same device. After an observation period of 1 hr to rule out any bleeding at the level of the neck, the patient was extubated. Full heparinization was administered for an additional 3 days so that partial thromboplastin time was maintained between 1.5 and 2 times baseline values. Three hours after the end of the procedure, 70 mg of Clopidogrel bisulfate (Plavix, Sanofi-Synthelabo, Paris, France) was orally administered. The administration of Clopidogrel (70 mg/day) was maintained for 1 month. A regimen of orally administered aspirin (250 mg/day) was started the day after the intervention and was maintained for 3 months. At day 5 after endovascular treatment, follow-up duplex Doppler sonography of the right common carotid artery was performed. The anchor appeared as a hyperechoic structure with shadowing, and a color signal was noted as a rapidly changing mixture of red and blue behind it. The color artifact reported herein corresponded to the color Doppler twinkling artifact described by Rahmouni et al. These authors showed that artifactual color appears to be generated at random, strongly reflecting a medium composed of individual reflectors (Fig 3). 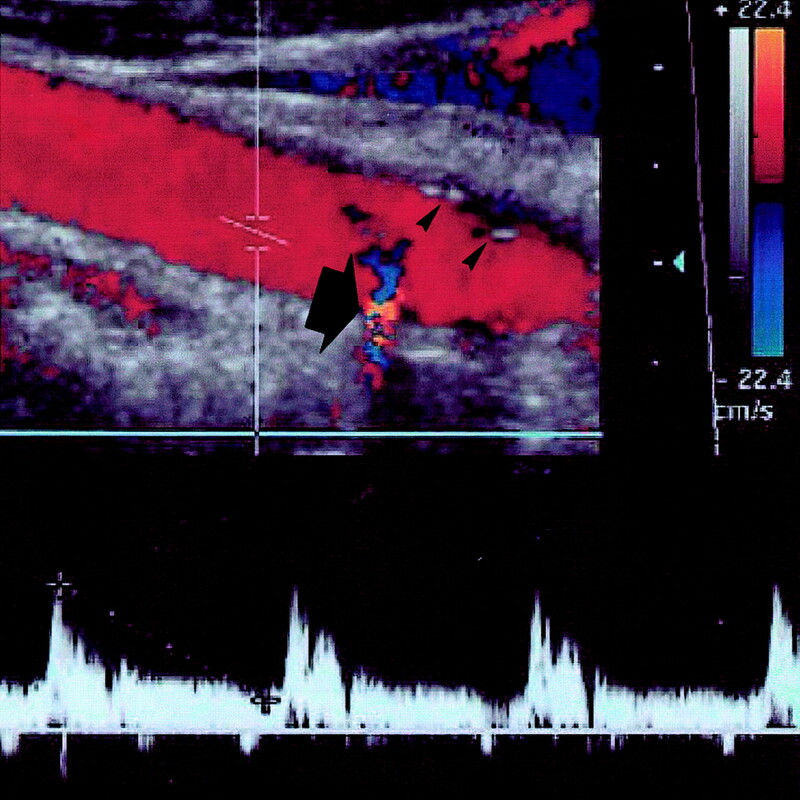 Color Doppler sonography was performed after 3 months and showed the total resorption of the anchor and persistence of the collagen plug at the outer surface of the carotid artery (Fig 4). The 3-month follow-up angiographic findings of the carotid artery were normal (Fig 5). Radiograph of the skull shows coiling of the aneurysm with the remodeling technique. Guiding catheter has been advanced into the petrous portion of the right internal carotid artery to facilitate stent delivery across the aneurysm neck. Photograph of the patient’s neck immediately after the carotid closure shows the external part of the Angio-Seal device. The tension spring (thick arrow) is positioned between the tamper tube compactor (open arrow) and the crimp stop (arrowhead) for 20 min to compact the collagen plug against the adventia of the artery. The bioabsorbable Dexon (polyglycolic acid) suture (thin arrow) is then cut, and the tamper tube compactor is discarded. 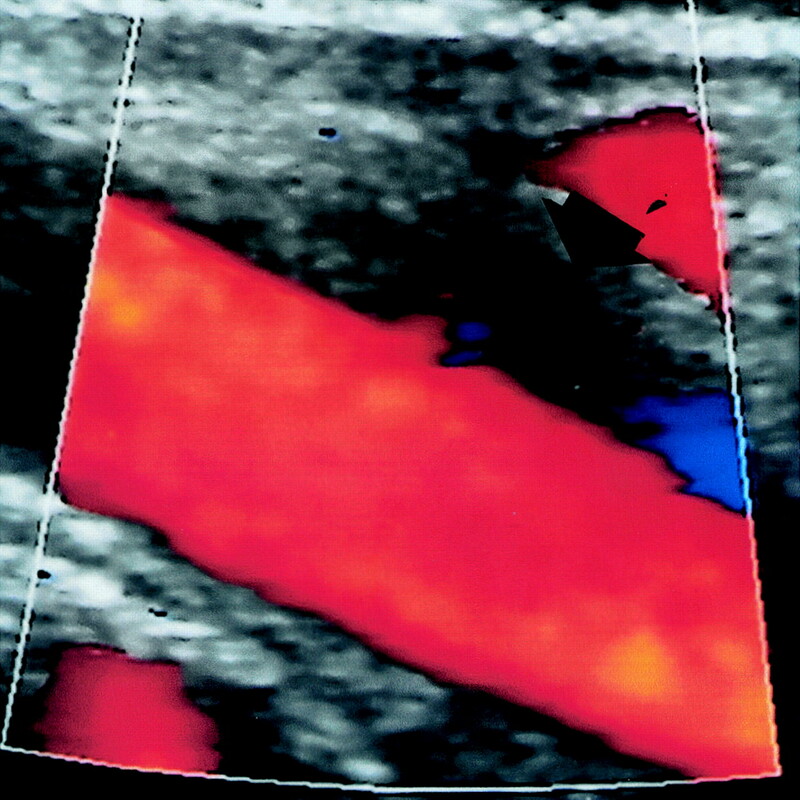 Duplex Doppler sonogram of the puncture site, obtained at day 5 after the procedure, shows normal flow velocity inside the carotid lumen. Twinkling artifact (thick arrow) is observed immediately behind the hyperechoic signal of the anchor (arrowheads). Three-month follow-up color Doppler sonogram of the carotid artery shows that the anchor has totally resorbed. The external collagen plug is persisting and appears as a hypoechoic structure (thick arrow). 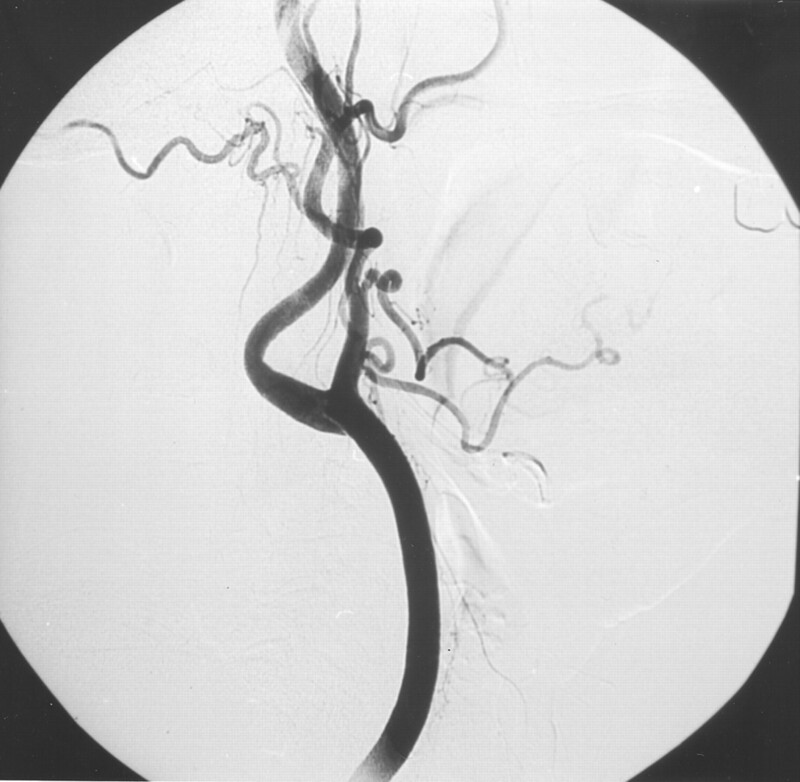 Three-month follow-up angiogram shows a normal carotid artery. The use of direct access via the common carotid artery allows some intracranial procedures that would not otherwise be feasible because of difficult or even impossible navigation through tortuous vessels. On a regular basis for patients in whom we encounter difficulties to position a guiding catheter into the carotid artery via a femoral approach, we consider direct carotid approach after common carotid artery puncture. 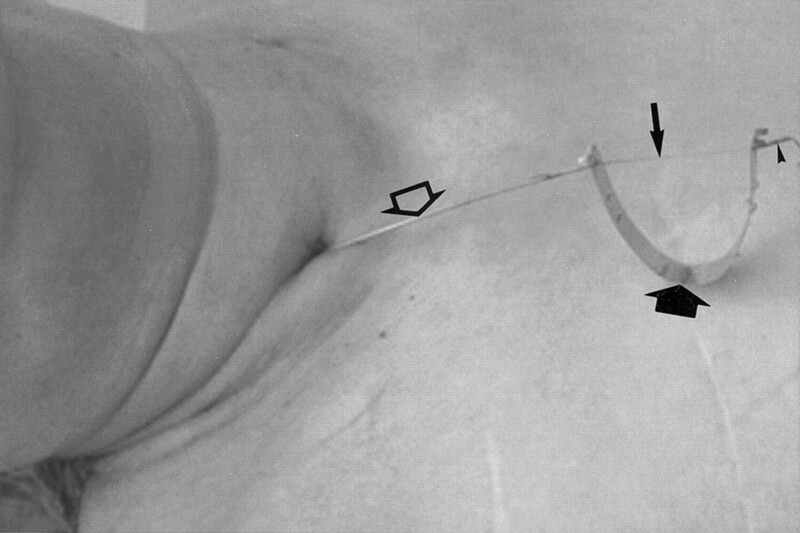 This technique is facilitated by the use of road mapping control because a diagnostic catheter has been anchored at the origin of the targeted common carotid artery via a femoral approach. The navigation of commercially available stents, which are potentially suitable for neurointerventional procedures, is still a matter of major concern. The trackability of a premounted stent on a balloon microcatheter is in many instances difficult and requires the advancement of the guiding catheter distally into the internal carotid artery. In our case, the 6-French guiding catheter was carefully advanced and positioned in the horizontal segment of the right carotid artery. This was not possible from the femoral route and required common carotid artery access. Anticoagulation with full heparinization is mandatory during intracranial stent delivery, and strong antiplatelet regimen during and after stent implantation is also advocated. Consequently, sheath removal from these patients is critical. Although deferring sheath removal and sending the patients back to the intensive care unit with the sheath sutured in the groin has been a common practice in interventional neuroradiology but has exposed these patients to thromboembolic complications, hematoma formation, retroperitoneal hemorrhage, or infection. It has been reported that ≤78% of femoral arterial sheaths left in place overnight develop significant clots, even when the sheath is perfused with heparinized saline. Anticoagulation with heparin and the use of new platelet-inhibiting strategies have led to a higher incidence of puncture site bleeding complications after intracranial angioplasty and stent deployment and have advocated the use of hemostatic closure devices. In our case, manual compression of the carotid artery would have resulted in an important flow reduction in the downstream territory (especially because prolonged compression time was expected) and could have compromised immediate stent patency by flow reduction and subsequent potential stent thrombosis. Moreover, prolonged manual carotid compression can be deleterious to the patient’s neurologic status because cerebral flow impairment may lead to brain ischemic insult, particularly in cases in which the anterior communicating artery and ipsilateral posterior communicating artery are not functional. Hence, if manual compression is not efficient enough, the patient is exposed to the risk of neck hematoma and tracheal compression. Therefore, keeping in mind the need to obtain quick hemostasis and patency of the stent, we thought to apply the Angio-Seal hemostatic closure device to the carotid arteriotomy in the same manner in which we had applied it to the femoral access. According to the manufacturer, this hemostatic puncture closure device is a bioabsorbable, sheath-delivered vascular device that deposits an anchor (50% lactide/50% glycolide copolymer) attached by an absorbable suture intraluminally against the inner arterial wall and a small collagen plug on the external surface of the artery. As the sheath and carrier tube of the Angio-Seal system are removed, the anchor and the collagen plug are drawn together and the arterial puncture site is mechanically sealed (sandwich technique). According to the manufacturer, in an artery with a 9-mm diameter, the anchor of a 6-French Angio-Seal device occupies 4% of the lumen. Softening of the anchor by water absorption starts as soon as the first hours, and encapsulation of the anchor by endothelial cells is noted within the first 7 days so that it is excluded from the blood stream. The absorption of the anchor is complete with healing of the arterial wall in <90 days. The collagen plug, which is in contact with the adventia of the artery, resorbs during a longer period of time. The use of the Angio-Seal device for femoral closure has gained acceptance because it offers safe and quick hemostasis and better comfort for the patient than do suture-mediated hemostatic closure devices. The complication rate is low, but complications include AVF, pseudoaneurysm, hematoma, and flow impairment with resulting ischemia. Direct thrombosis at the anchor site and distal emboli (from intraluminal collagen plug protrusion, thrombi, or anchor migration) have been considered responsible for severe ischemia in peripheral vessels. It is hoped that as physicians become more experienced and as this device technically improves, complications will significantly decrease. The learning curve of implantation is the critical factor influencing the safety of the Angio-Seal device. 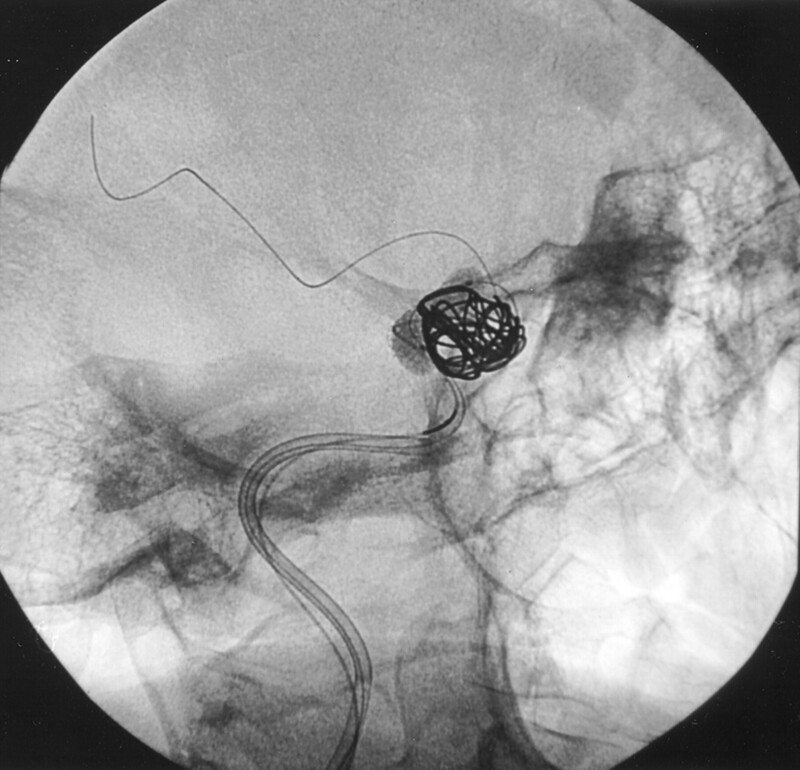 Because an ischemic complication in the carotid artery territory could have been catastrophic with few therapeutic resources, careful and cautious delivery was performed by a senior interventional neuroradiologist who had extensive experience with use of the Angio-Seal device in the femoral artery. Immediate and mid-term clinical and sonographic follow-up confirmed that the carotid lumen and flow were not compromised by the anchor and that the collagen plug was in an adequate position. At the 3-month follow-up, the anchor had completely resorbed, with restitution of the normal arterial wall whereas the collagen plug was still present on the external side of the arterial wall. This closely corresponded to a previous sonographic description at the level of the femoral artery. In this patient, use of the Angio-Seal device allowed us to achieve immediate hemostasis after percutaneous puncture and catheterization of the common carotid artery with a 6-French sheath while maintaining both anticoagulation and antiplatelet therapy. It avoided the need for prolonged manual compression of the carotid artery, which impairs downstream flow of the cerebral circulation and could be deleterious to the patient’s neurologic condition. Accepted after revision March 17, 2002.